No need for a map to get lost in the millions of metaphors this book is sprinkled liberally with. A story of a Pakistani family and South Asian community lost in trying to finding ways of living (and loving) in Dasht-e-Tanhai (the “Desert of Solitutde”) somewhere in England. In the way of (according to the author) Pakistani thinking, the language brims with flowers (and moths & butterflies) in a way that is entirely and utterly enjoyable. Been there, done that, still doing? Matchmakers: In Irish they are Babhdóir, in Yiddish they are Sadchen. For fruit flies, the matchmakers might be gut bugs. Fruit flies (Drosophila melanogaster) with the same set of intestinal bacteria preferred mating with each other, discovered professors Eugene Rosenberg, Daniel Segel, and doctoral student Gil Sharon at Tel Aviv University in Israel. They published their results in the Proceedings of the National Academy of Science. When the flies’ intestinal bacteria were killed off with antibiotics, the flies mated randomly. When the bacteria were added back into their guts, they went back to mating preferentially. Mating choice and reproductive separation are believed to drive evolution. And the researchers believe this study suggests evolution can be driven by a community of organisms living symbiotically, not just the individual organism. The symbiotic community of organisms, called a holobiont, evolves together. 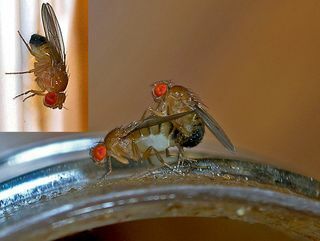 In this case, the fly’s intestinal bacteria influenced mate choice. In the experiment, the researchers mixed two different foods into the agar medium on which the fruit flies were raised. One lived on a standard cornmeal-molasses-yeast mixture. The other was raised on starch. Humans make it so complicated sometimes… why not just trust your stomache bacteria? I’m going to be honest of what I’m going to say here. I’m 25 this year. I’m very pretty, have style and good taste. I wish to marry a guy with $500k annual salary or above. You might say that I’m greedy, but an annual salary of $1M is considered only as middle class in New York. My requirement is not high. Is there anyone in this forum who has an income of $500k annual salary? Are you all married? what should I do to marry rich persons like you? Among those I’ve dated, the richest is $250k annual income, and it seems that this is my upper limit. If someone is going to move into high cost residential area on the west of New York CityGarden(? ), $250k annual income is not enough. I have read your post with great interest. Guess there are lots of girls out there who have similar questions like yours. Please allow me to analyse your situation as a professional investor. My annual income is more than $500k, which meets your requirement, so I hope everyone believes that I’m not wasting time here. From the standpoint of a business person, it is a bad decision to marry you. The answer is very simple, so let me explain. Put the details aside, what you’re trying to do is an exchange of “beauty” and “money”: Person A provides beauty, and Person B pays for it, fair and square. However, there’s a deadly problem here, your beauty will fade, but my money will not be gone without any good reason. The fact is, my income might increase from year to year, but you can’t be prettier year after year. Hence from the viewpoint of economics, I am an appreciation asset, and you are a depreciation asset. It’s not just normal depreciation, but exponential depreciation. If that is your only asset, your value will be much worried 10 years later. By the terms we use in Wall Street, every trading has a position, dating with you is also a “trading position”. If the trade value dropped we will sell it and it is not a good idea to keep it for long term – same goes with the marriage that you wanted. It might be cruel to say this, but in order to make a wiser decision any assets with great depreciation value will be sold or “leased”. Anyone with over $500k annual income is not a fool; we would only date you, but will not marry you. I would advice that you forget looking for any clues to marry a rich guy. And by the way, you could make yourself to become a rich person with $500k annual income. This has better chance than finding a rich fool. So we all know how love can create those euphoric feelings… how it feels that you’re almost addicted to the person, want to see andtalk to them all the time? Well, previously it’s been clear that the way that the initial period of love, the attraction phase, signified by elevated levels of dopamine, has very similar ways of operating in our brains as cocaine and similar drugs. Now, a team at Stanford took this one step further and gave postdoc students (a.k.a. campus guinea pigs) mild doses of pain while at the same time showing them pictures of their loved ones. Check out the publication release at eurekalert.org & thanks to Alex for sharing the link with me! Anyone who uses Metropolis shots as their music video deserves respect. It isn’t the most romantic theory, but scientists believe kissing was developed to spread germs which build up immunity to illness. As the relationships progresses and the kisses become more passionate, the woman’s immunity builds up, cutting her odds of becoming ill.
Dr Hendrie said: “Information concerning body tone, smell, reproductive condition, disease state and, of course, personal physical and oral hygiene can all be gained solely from close physical proximity. To me, explaining things makes them more beautiful. Think of all the effort, iterations and different attempts to solve this problem that must have been tried in evolution’s path. In the end, it ended up with such a simple, beautiful activity. I guess you’ll never be mine completely… and that’s OK.
PS. Robyn is a great Swedish artist!